1Institute of Health and Sports Sciences, University of Tsukuba, Ibaraki, Japan. 2College of Art and Sciences, Chiba University, Chiba, Japan. 3Biomedical Research Laboratory, Morinaga Milk Industry, 4-4-22 Meguro, Meguro-Ku, Tokyo 153, Japan. 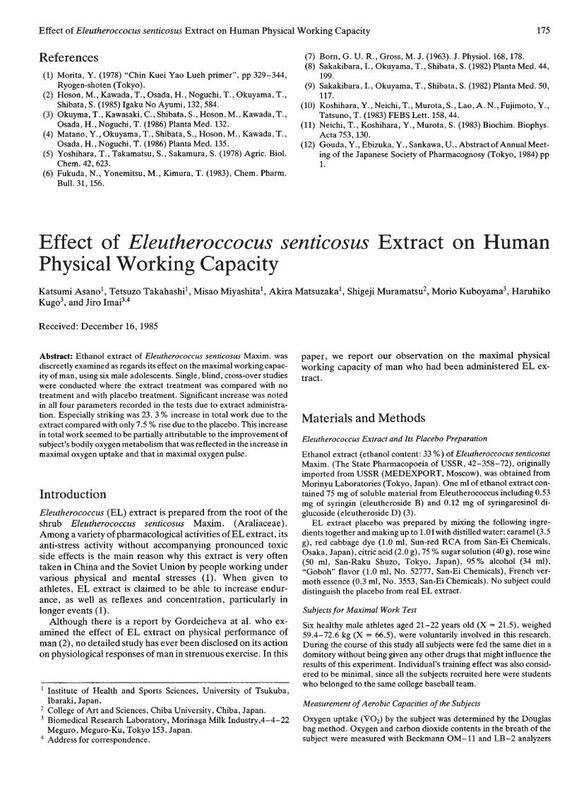 Ethanol extract of Eleutherococcus senticosus Maxim, was discreetly examined as regards its effect on the maximal working capacity of man, using six male adolescents. Single, blind, cross-over studies were conducted where the extract treatment was compared with no treatment and with placebo treatment. Significant increase was noted in all four parameters recorded in the tests due to extract administration. Especially striking was 23.3% increase in total work due to the extract compared with only 7.5% rise due to the placebo. This increase in total work seemed to be partially attributable to the improvement of subject's bodily oxygen metabolism that was reflected in the increase in maximal oxygen uptake and that in maximal oxygen pulse.